I was so excited by the premise of Stephanie Garber’s Caraval (2017) that I listed it as one of my most anticipated books of 2017. Word has it that there are already plans to make Caraval into a film and I expect it is going to get a fair amount of hype. I can understand why and yet I find I cannot give it more than three stars. I will attempt to justify the reasons why. Scarlett spent her childhood dreaming of the magical show called Caraval and its mysterious proprietor, Master Legend. Over the course of ten years she write him letters, begging him and his players to come to the small island where she lives with her sister, Tella, and her oppressive, violent father. Now grown-up and engaged to be married, Scarlett finally receives three invitations to attend Caraval. But the invitation is too late. Though she knows her younger sister Tella will be desperate to go, Scarlett can’t risk sabotaging her engagement. She has never met her fiancé but he writes nice letters and is the only chance she has of escaping her father’s tyrannical rule and of saving her beloved sister. What’s more, she knows that her father’s retribution for running away will be truly terrible. But, unlike Scarlett, Tella has a wild nature. Enlisting the help of a hopelessly dashing sailor named Julian, Tella tricks Scarlett into embarking on the voyage to Caraval. Scarlett and Tella are separated on the journey and, horrified that she has been duped but determined to find her sister, Scarlett allows Julian to lead her into the secret world of Caraval. At the gates Scarlett is faced with two options — take part as an onlooker, or play the game. Everything in Caraval is a performance and nothing is real. Scarlett knows this when she agrees to play. And yet when she discovers that her sister has been kidnapped as part of the game, the magic of Caraval takes on a decidedly sinister feel. All too soon the lines between reality and performance blur and it becomes clear that to find her sister, Scarlett must play the game, and play to win. Caraval is surprisingly dark. I expected a glittery, fairy-tale circus but what I got had the feel of a drug-addled nightmare — mostly in a good way. Garber does a wonderful job of playing with the idea of reality and make-believe. She is able to sustain an ever-present tension and produces a pervasive, spine-tingling uneasiness. Despite the fact that Scarlett is repeatedly told that nothing is real, the reader falls with her into a vortex of doubt. There are also pleasing moments of magic to counter the creepiness of the game. In a contained world like Caraval the reader should want more than anything to be set free to explore. The author’s skill lies in giving away just enough detail to tantalise and by and large Garber manages this. From the clothes shop where a dress costs a day of your life to the drink that makes you colour-blind save for the most important details, Caraval is a most intriguing double-edged sword — you can have your dreams but they will always cost you. And so it was a great shame that the telling of Caraval was its own double-edge. Garber has a tendency to over-do descriptive language, which reads as if it was pasted in as an after-thought, and at times the prose falters over awkward phrases. When Scarlett notes that “Around her, the people on the street were as thick as a murder of crows,” I couldn’t help feel the flow of the story grind to a halt. Other words were simply unnecessary — the description of a “watery canal” particularly stood out. I was also confused by Scarlett’s sensory abilities. Garber makes it known that Scarlett feels her own emotions as colours and utilises a lot of descriptive language to demonstrate that phenomenon. But Scarlett also notes that the tavern “smelled of laughter and boats, laced with sweetened ale” — which seems less an interesting form of synesthesia than a bizarre smell-based power the reader is not made aware of. It sounds as if I’m being picky and it’s true that one of two of these issues would have evaded comment — and rightly so. Unfortunately these issues are prominent in Caraval and, though I fear coming across as unbearably pedantic, it is worth raising them. I was also disappointed by the ending. One of the problems with fantasy literature is that by creating a magical world of limitless possibilities, the author risks their audience picking holes in the plot. “Why didn’t the eagles drop the ring into Mordor?” or “If Harry can apparate why didn’t he…?” You know the type of thing. It’s usually always possible to find ways that the characters could have done things differently or more easily achieved their goals. Mostly I try not to entertain these thoughts — it’s only a story, after all. But sometimes the issue of the “easier path” becomes too glaring to ignore. In Caraval I could understand the characters’ ultimate goal and why they wanted to achieve it. But I could not understand why that goal necessitated such complex machinations. Nor could not understand why the level of heartbreak and pain were necessary. Caraval does have the ingredients of success. There are magical potions, lamp-lit Venetian canals, a roundabout festooned with roses and all the gorgeous dresses and gothic paraphernalia you could want. There’s a love story with an impossible rogue who may or may not be a wrong’un, (though as a quick health warning it is my duty to warn you that this book contains the line: “He continued to smile at Scarlett, the way Scarlett always hoped a boy would, as if he wasn’t just attracted to her, but he wanted to protect and take care of her” — so be warned). Unfortunately these promising ingredients just didn’t come together as well as they might. For all its issues I do not want to put anyone off reading Caraval because the exciting plot, the perfectly-paced tension, and some intriguing ideas make it a fun read. I don’t doubt that readers who enjoy magical games and circuses will particularly enjoy it. 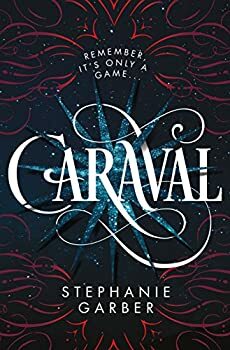 One of the most hotly anticipated YA books of the year, Caraval promises readers a game of love, secrets, danger and magic, but can Stephanie Garber‘s debut live up to its hype? Scarlett Dragna and her sister Tella have lived on a tiny island under the watchful gaze of their cruel and abusive father since their mother disappeared without a trace. Scarlett has dreamed for years of making her escape, and it seems she has finally found her way out: through an arranged marriage to a count, who promises to take her sister Tella away from the island as well. It is less than a week until her marriage when she receives an invitation from Legend, the elusive master of Caraval, a once-yearly performance where the audience participate in the show. Though she’s spent her whole life dreaming of attending, Scarlett decides there is no way she’d jeopardise the marriage that will finally enable her escape from her father. That is, until her sister and her enigmatic sailor lover kidnap her and take her to Caraval anyway. One drugged boatride and approximately twenty-four hours later, Scarlett finds herself at Caraval in the company of Julian, the mysterious rogue sailor that helped her sister kidnap her. He is (unsurprisingly) handsome, dashing, dark, etc., etc., etc., and it soon becomes apparent who the inevitable love interest is going to be. Whilst he is, in this respect, pretty predictable as YA romantic interests go, the fact that he was first introduced canoodling with Scarlett’s younger sister does add an extra element of conflict in there. Caraval itself is a sensory wonderland. It comes alive only after sundown, and therein its audience can find a host of magical potions, shape-shifting dresses and sights and smells they could never have imagined. Garber does err slightly on the side of purple prose here, with the flowery language sometimes detracting from the story she is telling. Whilst it’s interesting that Scarlett seems to experience the world through colours, lines like “Something about him made her feel perilous shades of silky black” have the tendency to pull readers right out of the story. “He tasted like midnight and wind” is another example of prose that feels, at times, just a little too try-hard. The premise of Caraval, as everyone keeps reminding Scarlett, is that it is only a game. But quite what this game turns out to be is never really clarified. Whilst Scarlett has five nights to find her sister by following somewhat dubious clues, it’s unclear who she’s competing against or what eventual prize they’re all seeking. But the meandering plot complements Caraval itself: though it’s difficult to pinpoint exactly what’s going on, there is no doubt as to its magic and mystery. Comparisons with The Night Circus are inevitable. Whilst Caraval bills itself as slightly darker, the books are similar, with The Night Circus being more focused on the development of the relationship between its two protagonists. 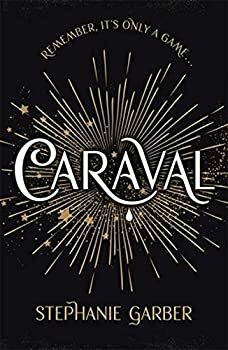 Caraval pays much more attention to the immediacy of the plot and keeps encouraging its readers to question what is real and what is fantasy. Despite having some issues, there is no doubt that Caraval will be a hit amongst its YA readers, particularly those that are satisfied with stock characters and love interests. The darker undertones of the novel add depth to its magical premise, and many readers will eagerly await the final book in this two-part series. Published January 31, 2017. Whatever you’ve heard about Caraval, it doesn’t compare to the reality. It’s more than just a game or a performance. It’s the closest you’ll ever find to magic in this world . . . Welcome, welcome to Caraval—Stephanie Garber’s sweeping tale of two sisters who escape their ruthless father when they enter the dangerous intrigue of a legendary game. Scarlett has never left the tiny island where she and her beloved sister, Tella, live with their powerful, and cruel, father. Now Scarlett’s father has arranged a marriage for her, and Scarlett thinks her dreams of seeing Caraval, the far-away, once-a-year performance where the audience participates in the show, are over. But this year, Scarlett’s long-dreamt of invitation finally arrives. With the help of a mysterious sailor, Tella whisks Scarlett away to the show. Only, as soon as they arrive, Tella is kidnapped by Caraval’s mastermind organizer, Legend. It turns out that this season’s Caraval revolves around Tella, and whoever finds her first is the winner. Scarlett has been told that everything that happens during Caraval is only an elaborate performance. But she nevertheless becomes enmeshed in a game of love, heartbreak, and magic with the other players in the game. And whether Caraval is real or not, she must find Tella before the five nights of the game are over, a dangerous domino effect of consequences is set off, and her sister disappears forever. As you observe in your early paragraphs, this might make a great movie. I’d love to know what you think Marion, let me know!